It was a cold December night at Jodhpur Railway Station. Passengers in monkey caps and shawls hurried towards their compartments with surprising swiftness, and the winter chill appeared to affect the platform’s resident mice as well, who were scurrying about everywhere, popping in and out of gaps under vendor carts, railway tracks, and staff room doors. I strongly believe that what I don’t see won’t hurt me. Or rather, what I choose not to see can’t hurt me. So I shut my eyes and tried to forget the mice. When I opened my eyes, I saw a well-fed member of the rodent family nonchalantly scurry past, inches, mere inches, from my shoes. A shudder ran through my body and I quickly followed my friend, Rahul, into the sleeper compartment of the Jodhpur-Jaisalmer Express. “Don’t you think it’ll be too cold?” Photograph by Owen Lin. Rahul and I were nearing the end of a three-week-long backpacking trip in Rajasthan and had marked out Jaisalmer as the last stop on our trail. We would be visiting the nearby Thar Desert—terrain I knew intimately from having, in middle school, memorised how to draw it on an outline map of India. Ever since, I’d dreamt of riding a camel into the desert, watching the sun set behind the dunes, and falling asleep under the open sky as the stars shone for me. “Don’t you think it’ll be too cold?” Rahul asked when I shared this dream with him. We had felt the severe chill of the Rajasthan winter early in the trip on a bike ride around Udaipur. As evening turned to night on our way back to the city from the fort town of Kumbalgarh, the temperature had dropped suddenly. Our old rusty helmets barely kept the nippy wind out of our ears. My jacket that felt superfluous in the afternoon heat was inadequate against the cold. I sat pillion, hands firmly plugged into my jacket pockets, as poor Rahul pressed on with a pair of flimsy gloves. And then the bike stopped. “I think we’re out of fuel,” Rahul said. I wondered aloud if we were going to die a painful death on the side of the road. Either the cold would kill us, or a wild animal would. Just a few kilometres earlier we had passed the carcass of a cow. Hypothermia seemed preferable. It was in the midst of these desperately sad thoughts that I suddenly heard the greatest sound known to mankind, the whirr of a motorbike coming back to life. Rahul had managed to restart it by turning on the fuel reserve. We would be visiting the nearby Thar Desert—terrain I knew intimately from having, in middle school, memorised how to draw it on an outline map of India. Rahul had now turned over and stretched himself out on his berth. It was a solid plan; to fall asleep before the cold got to us. After all, what we couldn’t consciously feel wouldn’t hurt us. At about one in the morning, I woke up to an intense chill that had overcome the compartment through gaps in windows that refused to seal shut. Rahul was awake as well, hugging himself tightly for warmth. The compartment was only half-full—the locals knew better—and most passengers had smartly brought their own blankets. “Five more hours,” Rahul said with a steely expression. He then quietly moved away from the window and up to the vacant middle berth. 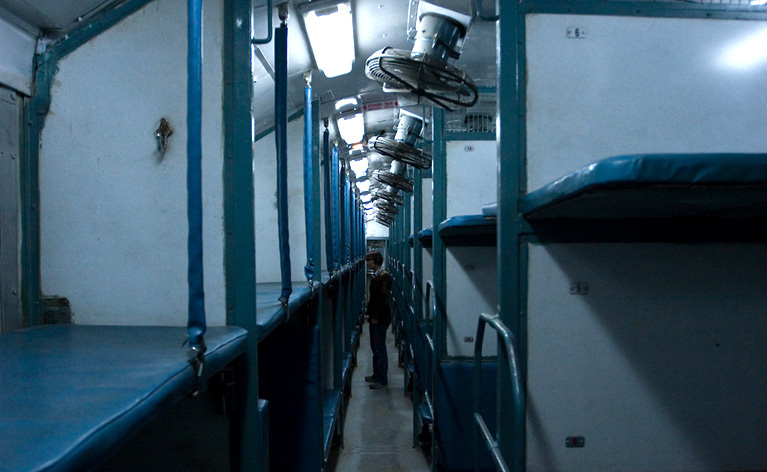 The five hours that we spent in that sleeper compartment felt like a lifetime. I fell in and out of sleep; my body would take pity on me and shut down to preserve my sanity only for the hard, frosty berth to shock me back to consciousness. It seemed like the seconds couldn’t have ticked any slower, and the compartment couldn’t have gotten any colder. Death by wild animal didn’t seem that horrible anymore. With an hour left, we started to walk up and down the compartment to get our blood flowing. To distract ourselves from our predicament, we made conversation centred around inane questions like ‘would a monkey cap have helped?’. To be honest, though, this was the quality of our conversations even when hypothermia wasn’t a threat. Just as we were getting into a heated debate on the number of inches in a foot, Rahul pointed to a man carrying a steel container at the far end of the compartment. “Do you think that’s a chaiwalla?” he asked, excited. As we approached the man, we realised that what he was carrying was not a steel container, but a can filled with water. And the man wasn’t selling hot tea, he was just another passenger traumatised by the cold. We knew then that we were in the desert. We had just seen our first mirage. Niyantha is a freelance writer whose work has appeared in publications such as Himal Southasian, The Cricket Monthly, The Hindu, The Madras Mag, The Aerogram, and The Asian Review of Books. His writing can be read at this location.